Understand the rules of vector addition, subtraction, and multiplication. Apply graphical methods of vector addition and subtraction to determine the displacement of moving objects. Figure 1. 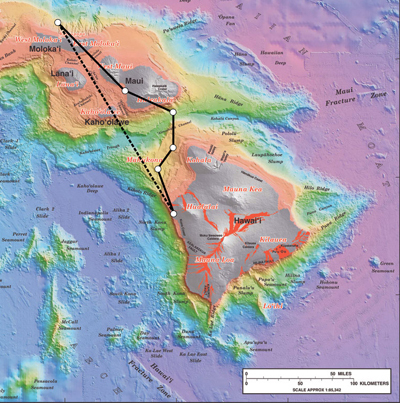 Displacement can be determined graphically using a scale map, such as this one of the Hawaiian Islands. A journey from Hawai’i to Moloka’i has a number of legs, or journey segments. These segments can be added graphically with a ruler to determine the total two-dimensional displacement of the journey. (credit: US Geological Survey). A vector is a quantity that has magnitude and direction. 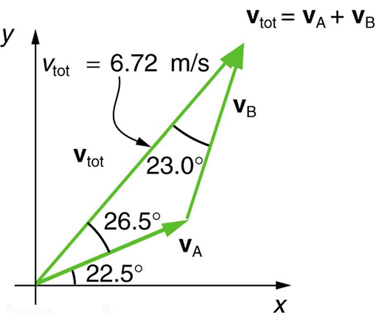 Displacement, velocity, acceleration, and force, for example, are all vectors. In one-dimensional, or straight-line, motion, the direction of a vector can be given simply by a plus or minus sign. 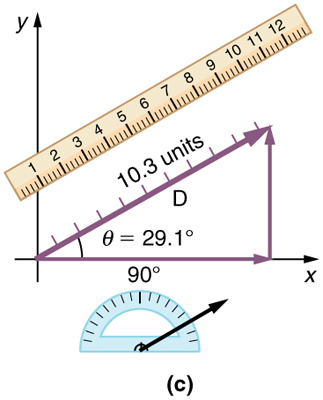 In two dimensions (2-d), however, we specify the direction of a vector relative to some reference frame (i.e., coordinate system), using an arrow having length proportional to the vector’s magnitude and pointing in the direction of the vector. Figure 2. A person walks 9 blocks east and 5 blocks north. The displacement is 10.3 blocks at an angle 29.1o north of east. Figure 3. 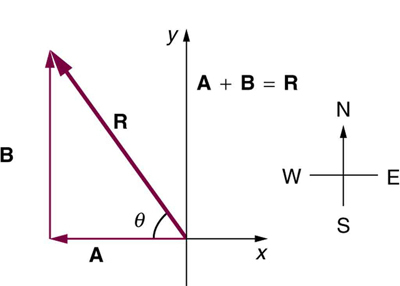 To describe the resultant vector for the person walking in a city considered in Figure 2 graphically, draw an arrow to represent the total displacement vector D. Using a protractor, draw a line at an angle θ relative to the east-west axis. The length D of the arrow is proportional to the vector’s magnitude and is measured along the line with a ruler. In this example, the magnitude D of the vector is 10.3 units, and the direction θ is 29.1o north of east. 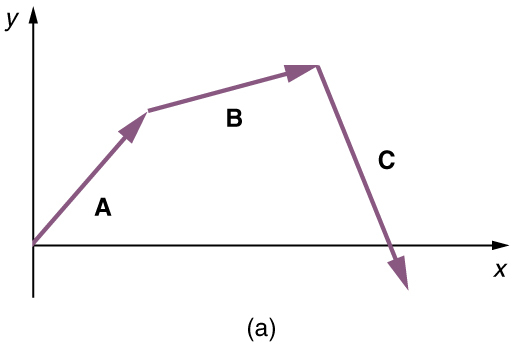 The head-to-tail method is a graphical way to add vectors, described in Figure 4 below and in the steps following. The tail of the vector is the starting point of the vector, and the head (or tip) of a vector is the final, pointed end of the arrow. Figure 4. 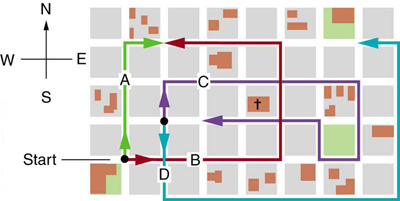 Head-to-Tail Method: The head-to-tail method of graphically adding vectors is illustrated for the two displacements of the person walking in a city considered in Figure 2. (a) Draw a vector representing the displacement to the east. 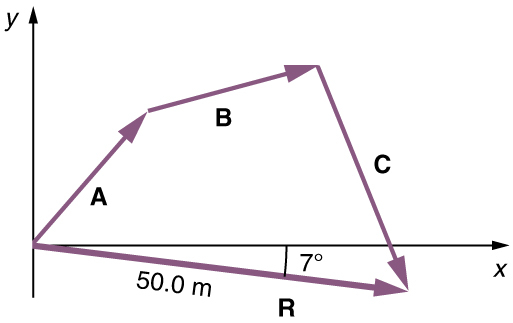 (b) Draw a vector representing the displacement to the north. The tail of this vector should originate from the head of the first, east-pointing vector. (c) Draw a line from the tail of the east-pointing vector to the head of the north-pointing vector to form the sum or resultant vector D. The length of the arrow D is proportional to the vector’s magnitude and is measured to be 10.3 units . Its direction, described as the angle with respect to the east (or horizontal axis) θ is measured with a protractor to be 29.10. Step 1. 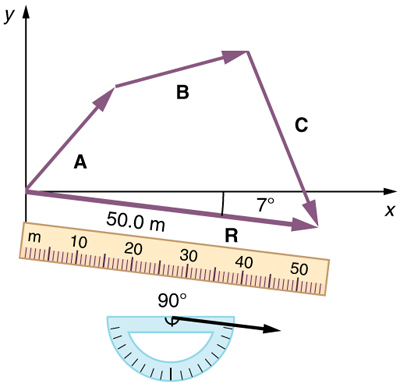 Draw an arrow to represent the first vector (9 blocks to the east) using a ruler and protractor. Step 2. Now draw an arrow to represent the second vector (5 blocks to the north). Place the tail of the second vector at the head of the first vector. Step 3. If there are more than two vectors, continue this process for each vector to be added. Note that in our example, we have only two vectors, so we have finished placing arrows tip to tail. Step 4. Draw an arrow from the tail of the first vector to the head of the last vector. This is the resultant, or the sum, of the other vectors. The graphical addition of vectors is limited in accuracy only by the precision with which the drawings can be made and the precision of the measuring tools. It is valid for any number of vectors. 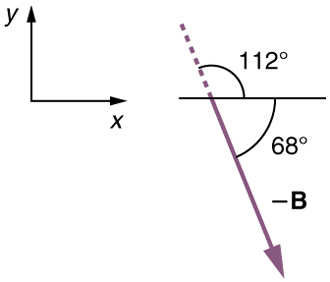 Use the graphical technique for adding vectors to find the total displacement of a person who walks the following three paths (displacements) on a flat field. First, she walks 25.0 m in a direction north of east. Then, she walks 23.0 m heading north of east. Finally, she turns and walks 32.0 m in a direction 68.0° south of east. (1) Draw the three displacement vectors. (2) Place the vectors head to tail retaining both their initial magnitude and direction. 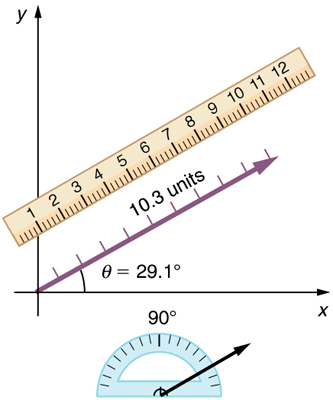 (4) Use a ruler to measure the magnitude of and a protractor to measure the direction of While the direction of the vector can be specified in many ways, the easiest way is to measure the angle between the vector and the nearest horizontal or vertical axis. Since the resultant vector is south of the eastward pointing axis, we flip the protractor upside down and measure the angle between the eastward axis and the vector. In this case, the total displacement is seen to have a magnitude of 50.0 m and to lie in a direction south of east. By using its magnitude and direction, this vector can be expressed as and south of east. The head-to-tail graphical method of vector addition works for any number of vectors. It is also important to note that the resultant is independent of the order in which the vectors are added. Therefore, we could add the vectors in any order as illustrated in Figure 12 and we will still get the same solution. Here, we see that when the same vectors are added in a different order, the result is the same. This characteristic is true in every case and is an important characteristic of vectors. Vector addition is commutative. Vectors can be added in any order. (This is true for the addition of ordinary numbers as well—you get the same result whether you add or for example). Vector subtraction is a straightforward extension of vector addition. To define subtraction (say we want to subtract from written , we must first define what we mean by subtraction. 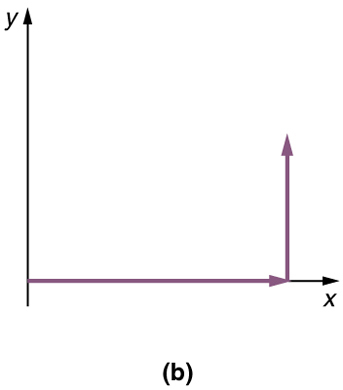 The negative of a vector is defined to be that is, graphically the negative of any vector has the same magnitude but the opposite direction, as shown in Figure 13. In other words, has the same length as but points in the opposite direction. Essentially, we just flip the vector so it points in the opposite direction. Figure 13. The negative of a vector is just another vector of the same magnitude but pointing in the opposite direction. 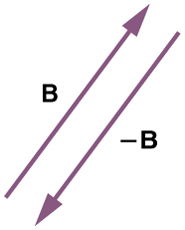 So B is the negative of -B; it has the same length but opposite direction. The subtraction of vector from vector is then simply defined to be the addition of to Note that vector subtraction is the addition of a negative vector. The order of subtraction does not affect the results. This is analogous to the subtraction of scalars (where, for example, ). Again, the result is independent of the order in which the subtraction is made. When vectors are subtracted graphically, the techniques outlined above are used, as the following example illustrates. A woman sailing a boat at night is following directions to a dock. The instructions read to first sail 27.5 m in a direction north of east from her current location, and then travel 30.0 m in a direction north of east (or west of north). If the woman makes a mistake and travels in the opposite direction for the second leg of the trip, where will she end up? Compare this location with the location of the dock. (2) Place the vectors head to tail. In this case, and south of east. In this case and north of east. We can see that the woman will end up a significant distance from the dock if she travels in the opposite direction for the second leg of the trip. Because subtraction of a vector is the same as addition of a vector with the opposite direction, the graphical method of subtracting vectors works the same as for addition. If we decided to walk three times as far on the first leg of the trip considered in the preceding example, then we would walk or 82.5 m, in a direction north of east. This is an example of multiplying a vector by a positive scalar. Notice that the magnitude changes, but the direction stays the same. if is negative, the direction is reversed. In our case, and Vectors are multiplied by scalars in many situations. Note that division is the inverse of multiplication. For example, dividing by 2 is the same as multiplying by the value (1/2). The rules for multiplication of vectors by scalars are the same for division; simply treat the divisor as a scalar between 0 and 1. In the examples above, we have been adding vectors to determine the resultant vector. In many cases, however, we will need to do the opposite. We will need to take a single vector and find what other vectors added together produce it. In most cases, this involves determining the perpendicular components of a single vector, for example the x– and y-components, or the north-south and east-west components. 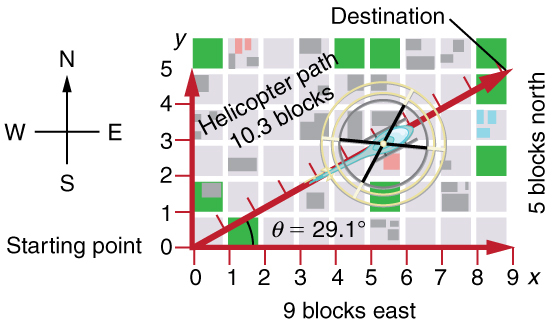 For example, we may know that the total displacement of a person walking in a city is 10.3 blocks in a direction north of east and want to find out how many blocks east and north had to be walked. This method is called finding the components (or parts) of the displacement in the east and north directions, and it is the inverse of the process followed to find the total displacement. It is one example of finding the components of a vector. There are many applications in physics where this is a useful thing to do. We will see this soon in Chapter 3.4 Projectile Motion, and much more when we cover forces in Chapter 4 Dynamics: Newton’s Laws of Motion. 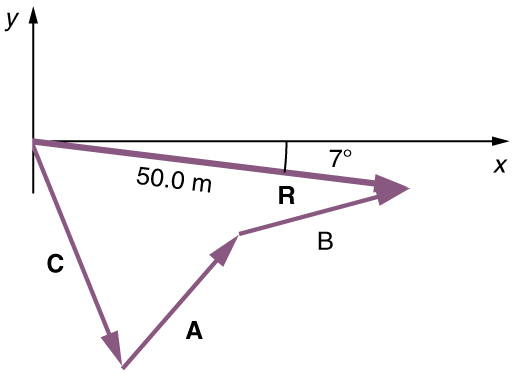 Most of these involve finding components along perpendicular axes (such as north and east), so that right triangles are involved. The analytical techniques presented in Chapter 3.3 Vector Addition and Subtraction: Analytical Methods are ideal for finding vector components. Learn about position, velocity, and acceleration in the “Arena of Pain”. Use the green arrow to move the ball. Add more walls to the arena to make the game more difficult. Try to make a goal as fast as you can. The graphical method of adding vectors and involves drawing vectors on a graph and adding them using the head-to-tail method. The resultant vector is defined such that The magnitude and direction of are then determined with a ruler and protractor, respectively. The head-to-tail method of adding vectors involves drawing the first vector on a graph and then placing the tail of each subsequent vector at the head of the previous vector. The resultant vector is then drawn from the tail of the first vector to the head of the final vector. 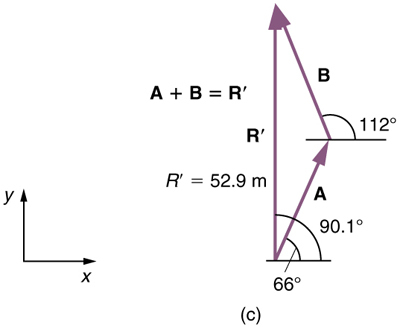 1: Which of the following is a vector: a person’s height, the altitude on Mt. Everest, the age of the Earth, the boiling point of water, the cost of this book, the Earth’s population, the acceleration of gravity? 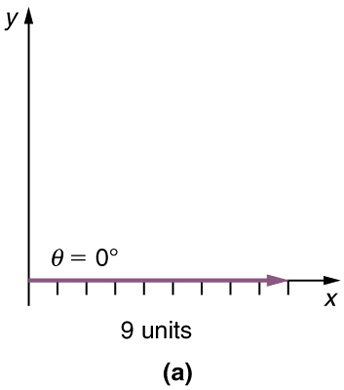 2: Give a specific example of a vector, stating its magnitude, units, and direction. 3: What do vectors and scalars have in common? How do they differ? 4: Two campers in a national park hike from their cabin to the same spot on a lake, each taking a different path, as illustrated below. The total distance traveled along Path 1 is 7.5 km, and that along Path 2 is 8.2 km. What is the final displacement of each camper? 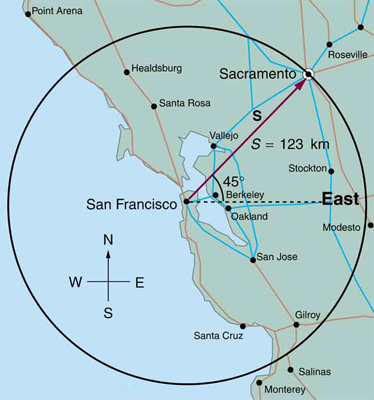 5: If an airplane pilot is told to fly 123 km in a straight line to get from San Francisco to Sacramento, explain why he could end up anywhere on the circle shown in Figure 20. What other information would he need to get to Sacramento? 6: Suppose you take two steps and (that is, two nonzero displacements). Under what circumstances can you end up at your starting point? More generally, under what circumstances can two nonzero vectors add to give zero? Is the maximum distance you can end up from the starting point the sum of the lengths of the two steps? 7: Explain why it is not possible to add a scalar to a vector. 8: If you take two steps of different sizes, can you end up at your starting point? More generally, can two vectors with different magnitudes ever add to zero? Can three or more? Use graphical methods to solve these problems. You may assume data taken from graphs is accurate to three digits. 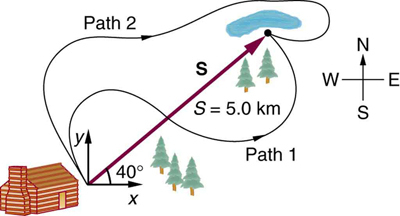 1: Find the following for path A in Figure 21: (a) the total distance traveled, and (b) the magnitude and direction of the displacement from start to finish. Figure 21. The various lines represent paths taken by different people walking in a city. All blocks are 120 m on a side. 2: Find the following for path B in Figure 21: (a) the total distance traveled, and (b) the magnitude and direction of the displacement from start to finish. 3: Find the north and east components of the displacement for the hikers shown in Figure 19. Figure 22. 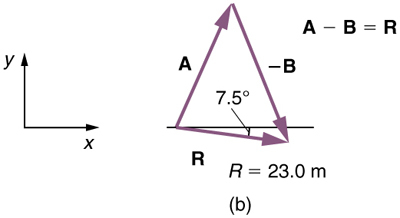 The two displacements A and B add to give a total displacement R having magnitude R and direction θ. 7: (a) Repeat the problem two problems prior, but for the second leg you walk 20.0 m in a direction north of east (which is equivalent to subtracting from —that is, to finding ). (b) Repeat the problem two problems prior, but now you first walk 20.0 m in a direction south of west and then 12.0 m in a direction east of south (which is equivalent to subtracting from —that is, to finding ). Show that this is the case. 9: Show that the sum of the vectors discussed in Example 2 gives the result shown in Figure 17. Figure 24. The two velocities vA and vB add to give a total vtot. 11: Find the components of along the x– and y-axes in Figure 24. 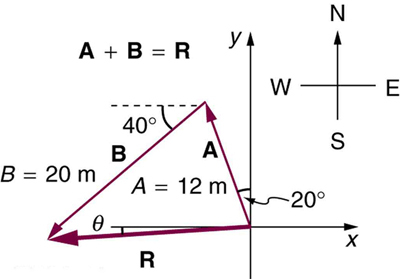 12: Find the components of along a set of perpendicular axes rotated counterclockwise relative to those in Figure 24.
with respect to the x-axis. 3.2 Vector Addition and Subtraction: Graphical Methods by OpenStax is licensed under a Creative Commons Attribution 4.0 International License, except where otherwise noted.